As PepsiCo, Inc. prepares to release its Q3 earnings next week, there&apos;s still curiosity about the controversial Kendall Jenner commercial, which aired for about a day early last April before getting yanked. "The minute I saw people upset, I pulled it," PepsiCo’s CEO Indra Nooyi recently told Fortune about the ad. "There were people on both sides, but at the end of the day, our goal is not to offend anybody." According to new data from YouGov BrandIndex, Nooyi has little reason to be concerned about her company&apos;s namesake beverage. 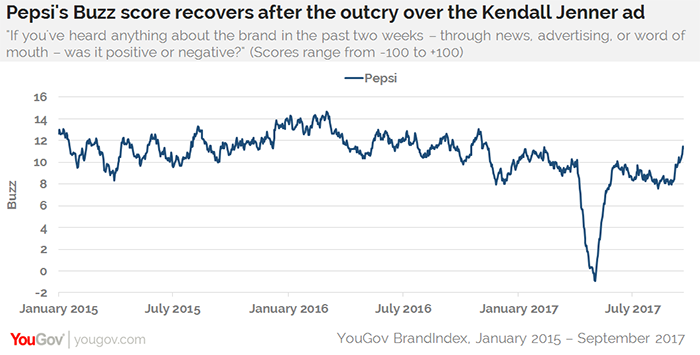 After an unprecedented drop in Buzz score, which asks US consumers if they&apos;ve heard something positive or negative about a brand in the past two weeks, Pepsi&apos;s numbers have returned to pre-Jenner levels. Indeed, between January 1, 2015, and March 31, 2017, Pepsi&apos;s average Buzz score was 11. 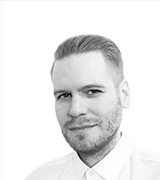 As of September 17, the brand has climbed back to 11 for the first time since the Jenner ad pushed Pepsi into negative territory for the first time since YouGov BrandIndex began tracking the brand nearly a decade ago.